Like their division rivals, the Brewers lost a top starter to injury before the season even started. But unlike the Cardinals, the Brewers have reason to expect their ace back before long. As a result, it appears that Milwaukee has the depth to get by without making external additions. Zack Greinke cracked a rib playing basketball and will start the season on the disabled list, so the Brewers will begin the eagerly anticipated 2011 campaign without their most accomplished starter. Yovani Gallardo, Shaun Marcum, Randy Wolf and Chris Narveson should provide rookie manager Ron Roenicke with a strong front four and the team doesn't expect to need an extra starter very often; GM Doug Melvin told MLB.com's Adam McCalvy that the Brewers will only need a fifth starter three times in April. Though the Brewers have a thin farm system – Baseball America ranked it 30th among the 30 MLB organizations – top prospect Mark Rogers started two games for the club last year and could be an option this spring. Rogers, a raw 25-year-old, has an upper-90s fastball and a potentially devastating curve, according to Baseball America. Those tools helped him post a 3.65 ERA with 9.3 K/9 and 4.0 BB/9 in the minors last year after missing 2007 and 2008 with shoulder operations. The right-hander has encountered some shoulder issues again this spring, however, so he's no sure thing. But the Brewers don't have to push Rogers to the major leagues, since Manny Parra (pictured) is available, as long as his back stiffness passes, as he expects it to. The left-hander has averaged 24 starts over the course of the past three seasons, including 16 starts in 2010. He posted a 5.02 ERA with 9.5 K/9 and 4.6 BB/9 as a swingman last year, logging 122 innings. Roenicke recently told McCalvy that he considers Tim Dillard, Wily Peralta and Amaury Rivas potential starters as well. The team's current options don't compare with Greinke, but Parra, Rogers or someone else should be able to provide the Brewers with a handful of solid starts as their ace recovers. Wonder if the Brewers will try to recoup some money from Greinke since it is a non-baseball injury? I hope they do. When, oh when, will our young baseball stars learn of the folly of Aaron Boone? Unless it’s in his contract, forbidding other sports, the Brewers may not want to start off a relationship with their star pitcher on a sour note. Granted, he’s in the wrong here, but it would just be adding insult to injury, no pun intended, to take his money. You can be certain Greinke feels just as bad and stupid over the matter. Dude, that rarely, if ever, happens. Wacky injuries have always been a part of the game, you just have to accept them. Joel Zumaya’s Guitar Hero induced injuries, Troy Tulowitzki needing stitches after slamming his bat in frustration, Adam Eaton stabbing himself opening a DVD wrapper…if you want more I can go on. Point is, you can’t hold players financially accountable for every little thing that happens to their bodies over the course of their lives and careers, unless you plan on keeping them in plastic bubbles. Now had he punched his father-in-law in the clubhouse, I’d say the Brewers would definitely have a case. He stabbed himself opening a DVD wrapper. Does he have no fingernails at all lol? Zack lives on his own planet. I just hope for the sake of Brewers’ fans that this is the only predicament he gets himself into. Yeah what a weirdo! First baseball player I’ve ever heard of getting injured, that’s for sure. That’s some whoosh you’ve generated. Let me guess, you’re an embittered Royals fan? Adam Wainwright, now Zack Greinke. Who’s next, Matt Garza? No one considers the Cubs legit contenders in that division, so a Garza injury wouldn’t mean much. It wasn’t basketball, he broke his rib washing his truck. Strong front four? Who is Chris Narveson? Who is Chris Narveson? Well let me tell you a little about him…drafted by the Cardinals in 2000 he was a mid level prospect whose real value came as trade bait; aka: Larry Walker in 2004. Traded with Charles Johnson to the Red Sox for Byung-Hyun Kim in 2005 where he was then picked up off of waivers by the Cardinals soon after. Granted minor league free agency in 2007, signing with the Brewers. He is a decent 4th to 5th starter if you have a strong top of the rotation (perfect example: Grienke, Marcum, Gallardo, Wolf) to hide him behind. So in short….he’s nothing important in the grand scheme of things. He has a 4.22 FIP over the last two seasons for the Brewers. That’s a better FIP than Matt Garza, for one. Very solid #5. Wouldn’t be be their #4 though? For a couple weeks, yeah. Greinke should stop playing basketball with Adrian Beltre. I’d feel pretty lousy if I accidentally cracked a friend’s rib playing basketball.But if my friend was a major league pitcher and by injuring him, I damaged the postseason hopes of a professional sports franchise and disappointed its fans… Well, then I’d really feel like garbage. Does Greinke missing a couple starts really damage the Brewers’ postseason hopes? Yes. Our interleague schedule is the toughest in the league and missing Greinke for a few starts hurts. I’m not saying it *ruins* them, only that it damages them a bit. Baseball Prospectus’ postseason odds report, for instance, has the Cards, Brewers, and Reds within 3.4 projected wins of each other. 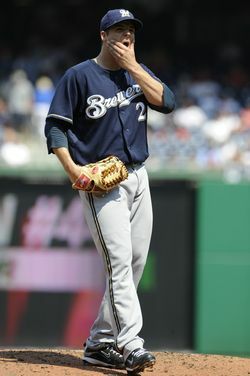 The Brewers will be replacing their ace with someone not normally good enough to make their rotation for 3 or 4 starts. Even if that only shaves a single win off their total, that may make all the difference. These teams are going to be close. Does Sixto Lezcano have 10 toes? Weird: my post got edited/censored/filtered to say “silly paw” instead of the random punctuation I’d used to censor myself comic strip-style. I went back and just made it say “garbage.” “Silly paw?” Weirdness. Quit coddling Mark rodgers and let him play. He looked great last fall. Granted it was only a handfull of innings, but they pulled him way too soon. He’ll be our #5 next year anyway when narveson is non tendered or traded. He’s having tightness in his shoulder and has had two shoulder surgeries that caused him to miss basically two years and you want them to quit coddling him? Did i stutter? At some point he needs to earn his roster spot. So what does Jonny Gomes have to say about Greinke’s injury? If I were Doug Melvin, I’d talk to the Orioles about acquiring Mark Hendrickson. Hendrickson could easily man Greinke’s spot in the Brewers’ front court. Pfft. He’s no Clint Barmes. why is he playing basketball? He didn’t think he could hack it as a baseball player so he was thinking about switching careers. I would guess because it’s fun, but that just sounds too obvious. None of this matters because the guy will be ready to start the home opener against the Braves. He won’t miss a start! GO BREWERS!! !